The right-wing revolt against Pelosi led by Seth Moulton and Kathleen Rice has attracted many headlined of late. These challengers haven’t made their specific policy or procedural concerns explicit, but there are hints of how they’d like to shift the caucus. In Rolling Stone, Tim Dickinson and Andy Kroll offer suggestive comments from Moulton and Tim Ryan in which Ryan laments political correctness and Moulton argues Democrats spend too much time complaining about Trump. These comments suggest that Moulton, Rice, Ryan and the other challengers want to move the party in a right-ward direction. 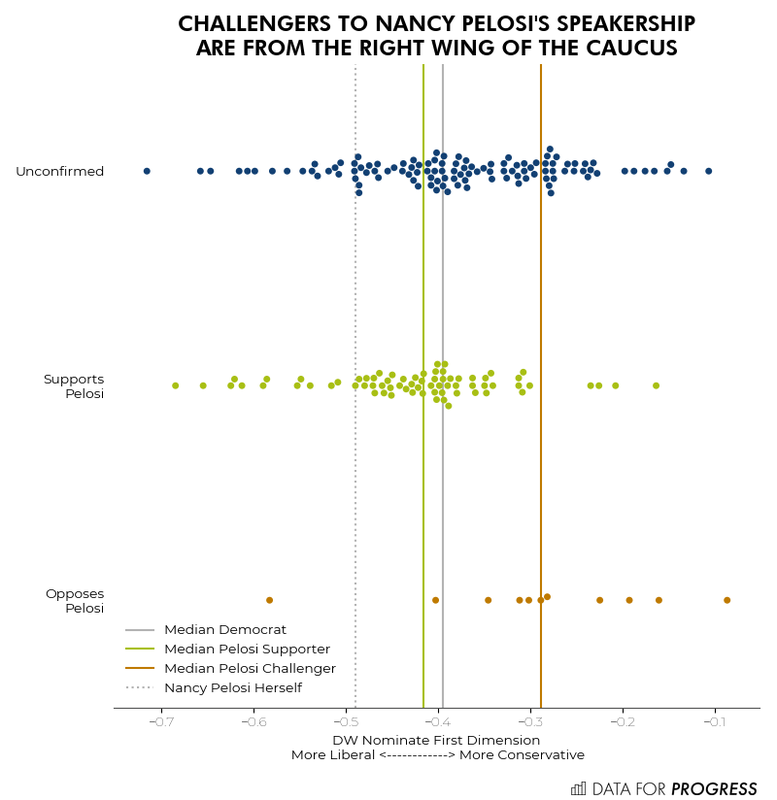 Our analysis of DW-Nominate, a standard measure of ideology shows this as well: the Democrats who oppose Pelosi are from the right of the caucus. The average DW-Nominate score of a challenger is -.31, compared to -.42 for supporters (and -.38 for unconfirmed). We analyzed the DW-Nominate of all the incumbent challengers (the new members do not yet have voting records to analyze). We also analyzed these challengers on the FiveThirtyEight Trump Score. The average Trump Score of Pelosi challengers is 25, compared with 19 for Pelosi supporters and 23 for those who are unconfirmed. Kathleen Rice, who has been one of the most vocal surrogates, has a Trump Score of 29, and both Moulton and Ryan have Trump Scores of 22. If Democrats take back the House of Representatives, they will have the power to decide who becomes Speaker of the House. Should Nancy Pelosi or a different Democratic representative be Speaker? The chart below shows attitudes among all Democrats, Democrats with highly warm feelings towards Indivisible and influencers (who participated in five or more political activities). The chart shows that overwhelmingly, the base does not want to see a more right-wing Speaker. If anything, they’d like someone more ready to stand up to the base. Moulton and Rice do not speak for the Democratic base.